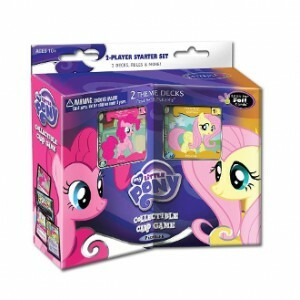 The first My Little Pony: Friendship is Magic collectible card game officially sanctioned by Hasbro is being released very soon by Enterplay. The Two-Player Starter Set is available now for ordering, and it’ll be shipping in January. “Build your decks around one of the Mane characters and build a separate problem deck. Race to solve (yours and your opponent’s) problems to earn points. First person to 15 points wins.” According to the publicity we’ve read, that makes it sound a lot simpler to master than it actually is! (Kind of like… friendship.) Check out the Enterplay site for more information.